There has been a growing interest in twin keel boats in North America. When first developed, these boats had large keels to support them when sitting on the mud flats, causing them to be slow in light airs due to excessive wetted surface. Yet these very same boats had to be perfectly at home sailing in the strong winds and rough waters of the North Sea and English Channel. They quickly acquired a reputation as good cruisers as their shallow draft and seaworthiness are features at the top of any cruising man's list. Bray Yacht Design. 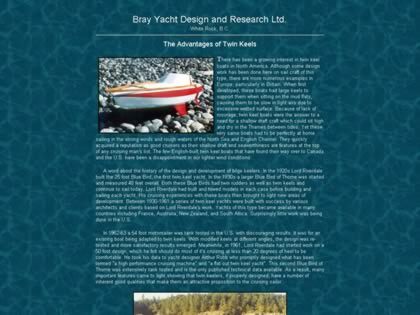 Web Site Snapshot: If available, above is a snapshot of the The Advantages of Twin Keels web site at http://www.brayyachtdesign.bc.ca/article_twinkeels.html as it appeared when this site was added to the directory or last verified. Please Note that Boat Design Net has no involvement with the above web site; all content and images depicted in the above thumbnail are the property and copyright of The Advantages of Twin Keels unless otherwise noted on that site. Description: There has been a growing interest in twin keel boats in North America. When first developed, these boats had large keels to support them when sitting on the mud flats, causing them to be slow in light airs due to excessive wetted surface. Yet these very same boats had to be perfectly at home sailing in the strong winds and rough waters of the North Sea and English Channel. They quickly acquired a reputation as good cruisers as their shallow draft and seaworthiness are features at the top of any cruising man's list. Bray Yacht Design.